NYFW always punches me in the stomach. When I'm here, I never have time to eat a proper meal and find myself subsisting on a diet of Fiber One bars, MBFW's official snack sponsor, and Tasti D-Lite. 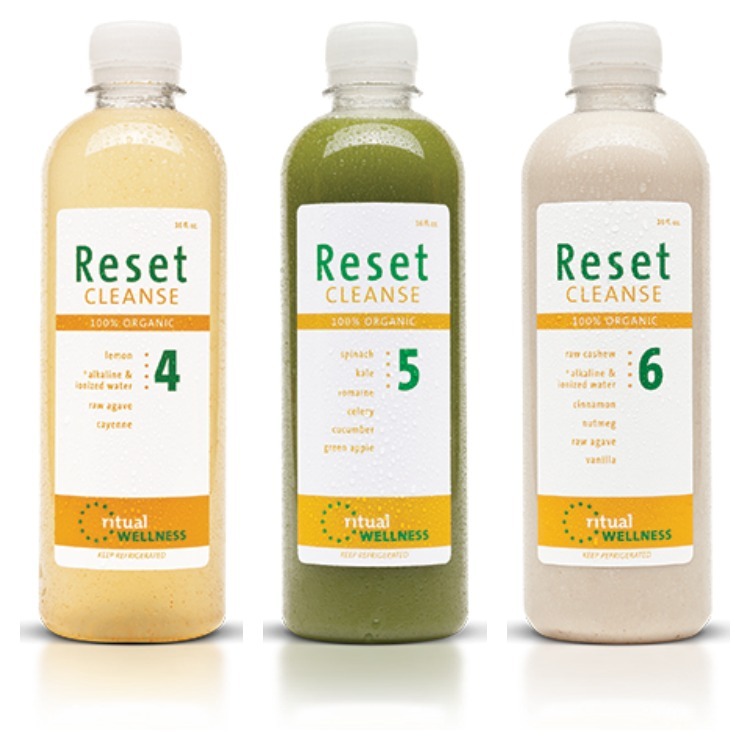 So, in anticipation of the gut wrenching week of fashion, I decided to go on a three day Ritual Wellness Reset cleanse before I left for New York. 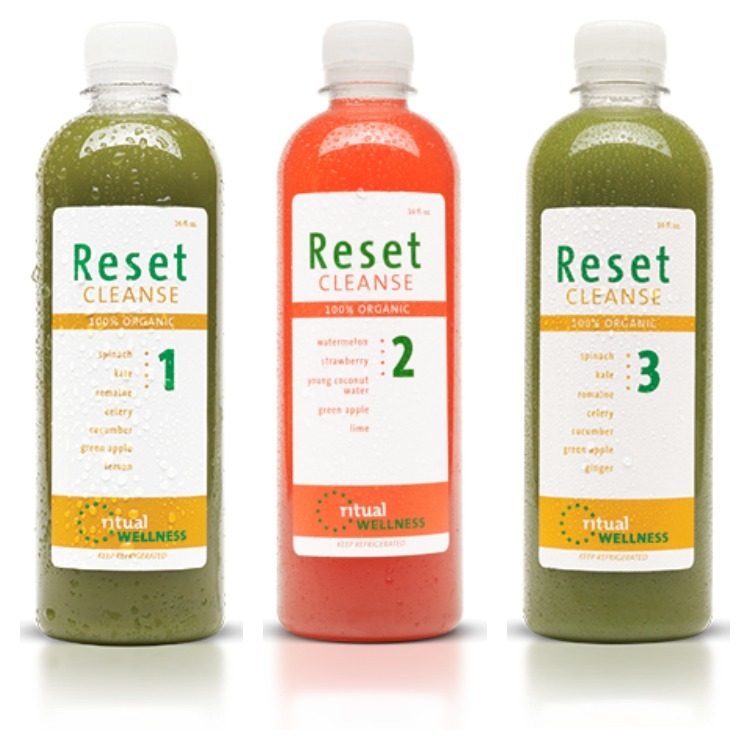 It's my first ever cleanse and the first time I've ever attempted three days without eating solids as food temptations always leave me weak in the knees and full stomached. After all, buffet is my favorite cuisine! On Day one, a heavy blue bag appeared at my front door housing eighteen bottles of fresh pressed juice packed in ice. Everyday, I'm supposed to drink six bottles in two hour increments. The first one was a green juice choked full of kale and other nutrient dense produce. It tasted good and familiar as I've juiced similar concoctions in the past. Two hours later, I happily gulped the watermelon and strawberry blend, my two favorite fruit. Shortly thereafter, I had a slight buzz. My body was drunk on vitamins. Back to greens with the third juice which took me to dinnertime. The fourth, a cayenne pepper lemonade tasted much better than it sounds and was quite refreshing. I decided to skip the fifth juice (another green) as I was already very full and went straight for the delicious protein rich cashew blend that taste like nutty vanilla milkshake. Halfway through, I started feeling a bit nauseous and lightheaded. So I sat on the couch and watched Malkovich get schooled by Damon in Rounders. After fifteen minutes, I felt like myself again. That night, I went to sleep unusually early and dreamed of Yogurtland froyo topped off with bacon and bits of prime rib. After getting over the first day hump, the second and third days were easy breezy. I had "dinner" with my friend on the second night which consisted of me watching him eat pizza from 800 degrees AND green tea shaved ice with red beans at Blockhead's Shavery while I sipped on my protein shake. Not one single bite. On the third day, my energy was off the charts as I spent the morning shopping and cleaning the house. 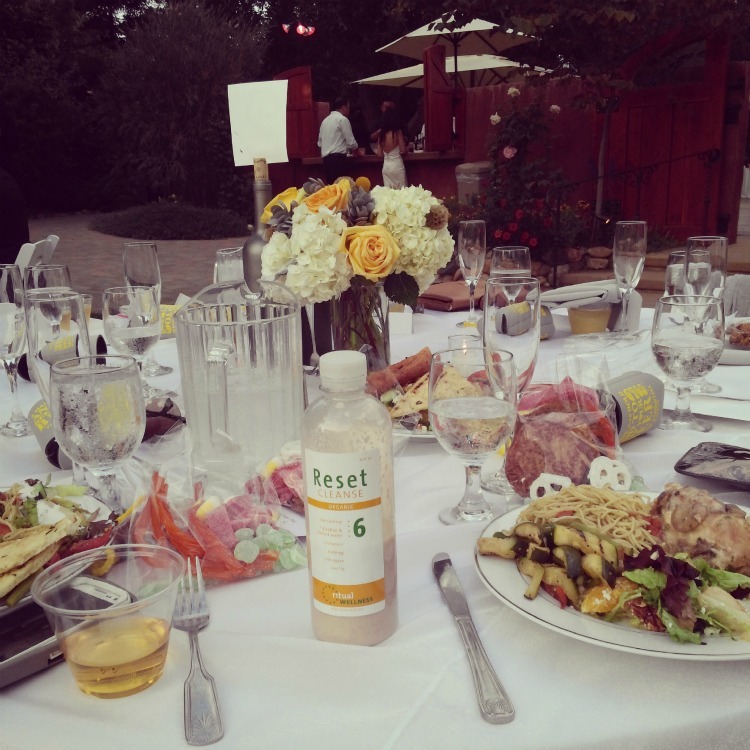 At night, I went to a friend's wedding and sipped my way through dinner service. And just like that, I was done with the cleanse. I truly couldn't believe it as I'm the worst when it comes to self-control and habitually eat like a fish. At the risk of sounding like an infomercial, if I can do it, so can you. I think the first day is mentally challenging because I was reprogramming my brain to view food differently. My body wasn't craving calories as the juices are calorie dense. It was craving the mechanical motion of biting and chewing. Once I got over that hump, I was able to focus on listening instead of dictating my body's needs. 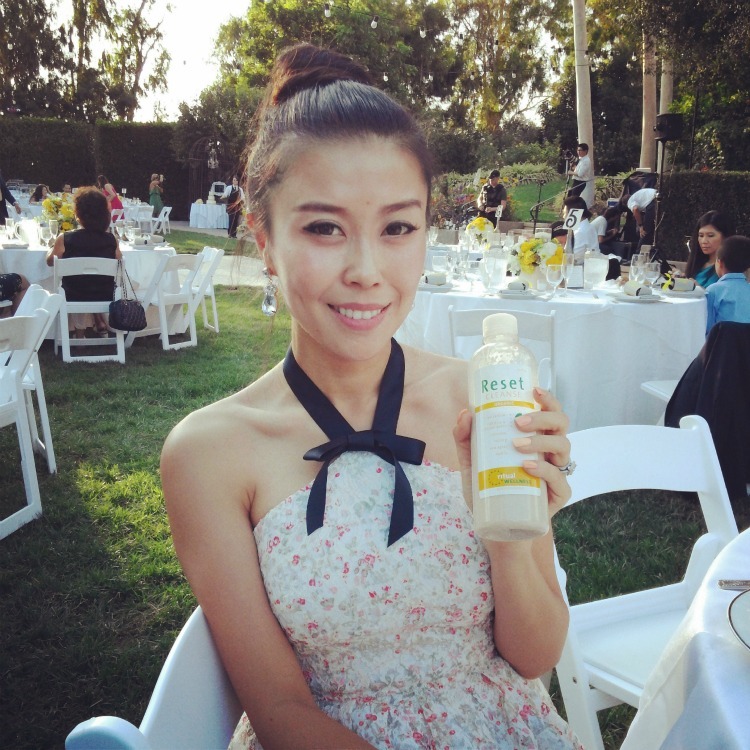 Thank you Ritual Wellness for three days of delicious juices and three days of character building! I love the last picture, very sweet!